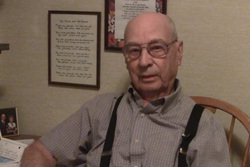 For my Oral History project, I interviewed Edwin Hendricksen of Walla Walla Wash.
Mr. Hendricksen was drafted at 19 years old by the U.S. Army in 1944. He served 1 year in Europe as an M.P. (Military Police) in World War II in 1945. This interview includes some of his experiences from the time he was drafted, when he was shipped out to Europe, and his experiences in Europe. It was a great honor to be able to interview someone like Mr. Hendricksen. Location of interview: Mr. Hendricksen’s residence, Walla Walla, Wash.
4:43 Being shipped out and the trip to Europe, he was in the last convoy of ships to leave New York. 23:00 Being in Europe after the war.